Damage to drains is typically caused by in-growing tree roots, voids created by broken pipes, and ground-water leaking into the pipe. 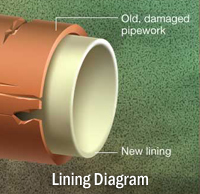 contact for provides pipe lining to repair damaged drains without the cost and disruption of excavation contact for has the capability of lining pipes with diameters ranging from 75mm to 450mm, where excavation would be impractical due to location or depth. 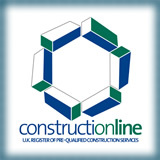 A range of lining options is available, to suit different applications. This includes both ambient and thermally cured systems. Polyester Needle Felt Tube of the correct thickness is impregnated with the chosen Resin using a combination of Vacuum and Rollers to ensure an even and complete saturation of the Carrier Felt leaving no weak spots. This is then either inverted directly into and through the drain or Dragged in and a Calibration Hose is inverted through the tube. Whichever method is chosen, the tube is inflated back tight to the walls of the existing pipe where, when inverted, it adheres to the pipe wall. The tube, having been inflated using air or a head of water is (when using Thermo Cure Resin) heated to the required temperature for a pre-determined length of time. When this has been achieved the Liner can be struck and brought back into service in a very short time span with minimal disruption. If only localised repairs are required why renovate the whole drain? Using Polyurethane Hydro Reactive Resin in Glass Fibre Matting we are able to offer a repair that has WRC Approval as being suitable for main sewer renovation. The matting is wrapped around an inflatable packer and once in place, pressed back against the previously cleaned wall of the drain and left to set. Due to the materials adhering to the pipe wall, even if wet, it forms a water-tight seal able to prevent both ingress and egress water plus it is highly chemical resistant.